This blog is 8 year old today. (Somehow I like to call it blog birthday because I feel it was born on that day!!). Thank you so much for all your love and support in these years. This blog would not have survived without that. We would love to hear from you on this occasion – those who always make sure to leave a comment and those who read the blog but never comment. Please take a moment and say few words. It would mean a lot to us. This would let us know who you are and what you like to read. Updated on Jul 7th : Thank you so much for each and every one who took time to say something. Feels great to know you all still read the blog. Great recipes and presentation…I have been following your blog for many years and have tried quite a few of your recipes…they are always very hit! Keep it up! Dear Shilpa, can’t imagine that your lovely blog is 8 years old. Seems like yesterday. 🙂 Wishing your blog many more years of success. Happy blog anniversary!! My heartfelt wishes for your blog on its 8th birthday! I am a regular visitor for past few weeks, tried some of them, came out really well. I really appreciate your efforts shilpa as well as the sustainability. Referring the magazines and collecting the recipes, trying them, making them available for us, it is very kind of you. I am a big fan of your aayi too. I am a konkani too, but’ from Kerala, in Australia now. regular cooking, I refer invariably to your blog for recipes. in a authentic Konkani style. Happy birthday and wish you many more! This was one of the first blogs that I started following and must say it did inspire to start my own. Keep up the good work! Congratulations and thank you very much for the delicious mouth watering dishes that you have been showcasing all these years. Keep it going Shilpa ! Congratulations and thank you for all your hard work and dedication. Your blog got me back in touch with all my favorite Udipi recipes. Thanks and keep it going Shilpa! Congratulations on completing 8 successful years. Thank you for always posting great recipes and making them seem so simple that I as a novice cook 4 years ago was confident on trying my hand in the kitchen. I followed and still follow many of your recipes and they are always so delicious. Keep it up! Best wishes. I don’t comment too much, but I am indebted to you for this blog. My boyfriend/partner and I started dating nearly 10 years ago–he being from Belgaum, me from Upstate NY. I couldn’t cook much at that time, and certainly not Indian food. Through your blog (I remember there not being so many back when you started), I slowly learned. I would print out a few new recipes a week, put them in my binder, and try them out on the weekends (when we were together). It was a lot of trial and error, but I learned. Eight years later, I can churn out dosa, appam, curry, paratha with the best of them. And I still have the binder for memory’s sake 🙂 Thank you (and your whole team/family) for all that you do. Hi , Shilpa, my heartfelt thanks for these recipes. Keep it up. Lovely blog….. Heartiest congratulation shilpa….. Congratulations!!! Am very glad that ‘ Aayis Recipes’ has completed 8 years and still counting. Thank you so much! Congratulations Shilpa!! You have done a great job. I have tried many recipes from your site and they have always turned out great. Happy Birthday to Aayi’s Recipes and many many thanks to you, Shilpa, and your Aayi for putting in such time, effort and love into it. My favorite thing about this blog is that we got to know each other, meet each other’s families and become friends. And of course what keeps me coming back is the simple and flavorful home-style recipes you document here. My late grandma was Konkani, and this cuisine means a lot to me. Always find your posts inspirational and a different twist on the Indian foods I’m used to. Congratulations…. Its come up to be a lovely lovely blog, so helpful to scores of people!! All credit to you. You have been my inspiration umpteen times when I have tried out recipes from here and has given me a lot of confidence too 🙂 Great work! Goes without saying that there’s passion and hard work to put all this together. I have told so many people about this blog and they too have become your fans. If we are about to try out something new, even my ma-in-law tells me… te ayisrecipes palay go ek pati!! Keep going…. I came across Aayi’s Recipes two years back when I just got married and started cooking, since then I am a big fan of you. I have tried most of the recipes from here and all have turned out to be very delicious. Your recipes have saved me through difficult times when I was a beginner in cooking 😀 and thank you so much for that. Love your writing style. Most of the recipes are very simple and can be prepared very quickly. CONGRATS!! !…..i have been following your blog since the last 5 years and i have to thank you……for all the appreciation i have recieved,for all the wonderful recipes,for the snippets of information,for evoking nostalgia about our konkani dishes…..love your blog and keep up the good work!!! Happy 8th birthday! Thank you for this wonderful blog and all the delicious recipes you share with us. Every good wish for the future. – Christine in Toronto, Canada. Happy 8th. birthday Aayi’s Recipes ! It has been such a wonderful journey discovering not just the food you cook and blog but more importantly, the person behind it. Wishing you and your Aayi all the best and look forward to many more blog birthdays! Congratulations Shilpa and Aayi…Keep it going!! Visited today to refer an old chicken biriyani recipe.. learnt its ur 8th birthday. Happy birthday! Keep up the great work! Congrats for the sucesful 8th year n hope it continus to celebrate many more years to come. Happy birthday and wish you many many more. First, I LOVED the name Aai’s recipes. I lost my mom a few years ago and after that I realized there were things she used to make that i never bothered learning from her. I should have. But your blog gave me a chance to do that. I may not always try out the recipes, but reading them gives me a warm nostalgic glow. Thanks Shilpa for your blog – this is the first time i am adding my comment – let 8th birthday turn into 80th and u still be adding lot new and excellent recipes to this wonderful blog ! Congrats Shilpa.. I refer your website almost on a daily basis especially if I have to cook any Konkani dishes.. your dishes ,when tried out accurately , turn out superb.. I appreciate u for the efforts u have put .. I love visiting your blog. I am a eggetarian.. and thankfully you post recipes for the likes of me..
Congratulations ! Great achievement to have kept up with the wonderful quality of the recipes.Though , I am not one for commenting regularly, My best wishes are always with you. Lage Raho!! Congrats once again!! I have saved the emails from your blog for 1.5 years now. Love your blog. Normally don’t post as I am a ‘beginner’ with Inidan cuisine – so have no real input. Have so far stuck with simple dahls and basmati rice with cardamom. Hoping to expand to cooking more with turmeric due to numerous health benefits of turmeric. I live in the Midwest at this time and many of the ingredients are hard to come by. Have eaten Indian food in Vancouver BC “little India” and more often Mayuri’s in Seattle, WA. The Vancouver BC Indian food was oh so spicy and good. Appreciate all your work and hope you continue to post. Happy Birthday Aayis Recipes! I am an avid follower of your blog and cannot thank you enough for readily available inventory of the most delicious Indian recipes. I would like to congratulate you on your hard work and perseverance in sustaining the blog. Keep up the good work!! 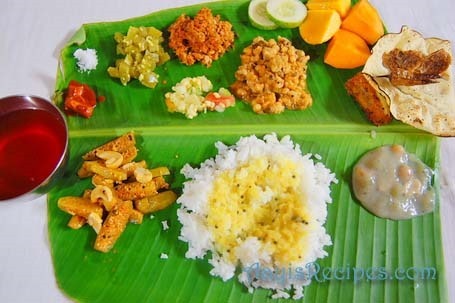 What are all the items on the banana leaf? A very Happy Birthday To Ayais recipe. Thank you for your wonderful recipes it has helped me overcome my fear of veg. cooking specially along with lovely non veg Konkani recipes. Congrats on your great and painstaking effort. All the very best. Its s Lovely , I must Thank you for all your posts. Initially I learn t cooking from you. Congrats Shilpa… and a very happy birthday to Aayi’s recipe. I have been a regular follower and happy to share my birth date with aayi’s recipe. HB! i love dis site…has a collection of genuine receipes which r a hit always! Have shared with my colleagues who also love dis site….All d best! Congrats on your 8th bday! My wife Deepa is a great cook and she really likes your website. Hi , Congratulations to you and your blog for such a lovely and long innings that too so far away from your country and loved ones , managing a family and work .Great , pls do keep on posting. I have been following ur blog for last 2 years though I have never commented ,as I am not too comfortable with the net .In fact I can say urs was the 1st ever food blog I saw prior to that I had never seen any food blog, thereafter i subscribed via email to your newsletter. I too am a Saraswat residing in Mumbai,India . Good to see konkani recipes being posted i such detail, it serves like an encyclopedia to the newer jet age generation. Congratulations once again. Pls do keep on posting. Congratulations on completing 8 years of blogging. I am an avid follower of your blog since a year. One of mine dear friend whose has been a regular follower of your site suggested this blog to me. Since then I have been visiting your site at least once a day. I have tried most your dishes and it has been an instant hit in my family. Thank you for all the wonderful recipes and presentations. Wish your blog many more years of success. Congratulations!!!! Keep it up!!!! Happy Birthday to your blog and congratulations to you for maintaining this blog for 8 years long. “Aayis Receipes” Wish U Happy Birthday & Heartiest Congratulations for completing 8 years. Its Gr8 to see Konkani receipes being posted with all the minute details which are really useful and helps us. This is one rare site that we get to learn our own Konkani receipes. And its great of You that u take time to share the receipes. Gr8 Shilpa. Keep it Up. All the Best. And Wish U such more years of Blogging. Bye Take Care. Congratulation to you on your 8th Birthday. I have been visiting your site regularly but have never commented. I really regret for that. But because of your site it is very easy for me to prepare authentic GSB recipes on the festivals. Thank you so much for guiding me in detail about the importance of festival & posting regularly all the related recipes. Many Many Happy Returns of the Day Shilpa & keep posting yummy recipes. Congratulations on the blog birthday! Your simple yet yummy recipes have helped so many women (especially mine) in their daily household. Keep up the amazing work. Congratulations !!!! Thank you to your Aayi & to you, for a wonderful down to earth blog. Wishing you continued success in the years ahead. You are truly an inspiration to many of us. Keep up the good work. Thanks for the ongoing parade of lovely recipes. I struggle a bit with the metric system of measures, but the dishes I’ve tried have been a great hit. Thanks, so much and I hope that you will keep sharing your cooking secrets with us. Congrats. I am one of those who has been following your blog since the beginning but commented only once in 2006 on your profile page. surprisingly the comments are still there. I came across your blog while looking for some randhayi while learning to cook in NJ. The site has changed and so has my location. I am back to India now but still follow your blog. so so helpful! wonderful collection. Yours was the first food blog I cam across. I instantly became a fan, love the humble, simple approach of it. Have tried few recipes and they were always wonderful. I read and followed many blogs after that but my love for Aayi’s recipes continues. Its commendable that you manage this so well with a lovely little boy . Hi shilpa,many congrats to you and your aayi on 8 yrs completion of this blog! Kudos to you for the efforts you put in. I regularly follow your page on facebook.your eggless dates cake is a big big hit! Just loved it. And i also like it when you post sumthing about ur son ishaan as i too have a 3 yr old son. I also love ur posts about what you have prepared for lunch or dinner on any day.overall i love reading ur blog.wishing aayis recipes more n more success in the years to come! Thanks! Congrats! I love your recipes and your writings. I have lost count, the number of times I HAVE made your eggless date cake. I’m a vegan, and I VEGANIZE THE date cake recipe, by using almond milk or rice milk. Thanks again for posting so many vegan recipes. I hope you can post many recipes made with tofu, seitan, tempeh and quinoa. Congrats Shilpa. It has been a pleasure to know you and your blog. May your blog grow and prosper and become a book soon. Many congratulations on the 8th anniversary! Quite the milestone! Thanks to you and your Aayi, we now know so many great ways with out everyday food and veggies. Thanks for the effort and good wishes for the future! I am following your blog for couple of years now, and this is the first time I am commenting on this. Must say you have a wonderful collection of authentic recipes and you present them well too. This blogs gives us a sneak view of your day today life as well along with your recipes. It’s been a long time and now we are very curious to know who this wonderful lady is. 🙂 Hope you wont mind sharing your pic (may be with your lovely family). Congrats and Best wishes for your future endeavor. Congratulations! I am a regular visitor of your blog and I love your recipes. Keep them coming! I’m one among those who visit/read the blog, almost all your recipes, but never comment 🙂 So, on this special occasion, I wish your blog ‘Happy Birthday’ and more success with years to come. As a suggestion,I would say, it would it really nice to click step by step pic, which would make us more confident that we too are getting the recipes right. great going love ur recipes.i have tried some of ur recipes and even ur home made remedies for cold and cough it really worked.everyone in my family loves ur recipes.thnks.pls keep giving us more recipes. Wish you success for years to come. Like most I have written to you for the first time. Thank you for all the great recipes. You are amazing. congrats on ur 8th blog burday !! have been reading it regularly for nearly 3 yrs now and yes, I am guilty of never writing to u.
Shilpa, thank you for working tirelessly on Aayi’s Recipes and congratulations on completing eight turns around the sun. Your recipes and your stories, as well as those penned by Varada-maushi, are very dear to my heart. These remind me of my childhood and meals eaten at the homes of my extended family. CONGRATULATIONS ! It feels like we (me and your fabulous Blog) just met y’day. Thank you very much for the wonderful recipes for all these years . All The Best for the many more years to come. Congratulations!! I have been following your recipes for the past few months and they have always come out great! !I always find the recipes i need from your blog. The pictures and the proportion of ingredients are perfect!! Thanks a lot and here’s wishing you many more years of blogging! Thanks again!